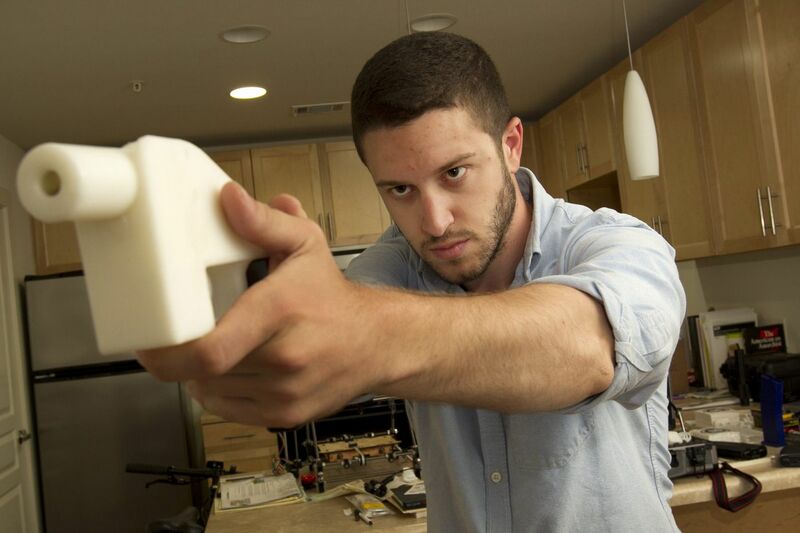 Cody Wilson shows the first completely 3D-printed handgun, The Liberator, at his home in Austin, Texas. in May. The maker of 3-D-printed gun files is now selling them — getting around, at least in some places, a judge's order that banned him from posting the files on the internet for a free download. Cody Wilson, founder of Defense Distributed, opened a website for sales Tuesday, taking orders for shipping files that include the designs for a working handgun and for a 3-D printer. It came the day after U.S. District Judge Robert S. Lasnik in Seattle extended a temporary ban against posting the files, blocking Wilson from publishing them online until a court case brought by Pennsylvania and other states is resolved. "His order doesn't prevent me from doing many other things. … If I can't post the files online, I'll simply sell them online," Wilson told a radio host Tuesday afternoon. "There's no way to prevent the sharing of this information." The 10 files are available for set-your-price donations, with a suggested $10 starting point, but also are available free. Wilson is seeking funding for his legal expenses. The files will be delivered to buyers on flash drives, according to the website. "Anyone who wants these files is going to get them," Wilson said at a news conference Tuesday in Austin, Texas, where he lives. He said he had received almost 400 orders. "Digital technology has immeasurably benefited the right to keep and bear arms," he said. "That's the message that I continue to advocate." Wilson posted the files earlier this summer after the U.S. State Department agreed to a settlement that allowed publication; it was involved because of international access to the files. That agreement sparked alarm among some politicians and gun control groups. The attorneys general of 19 states and the District of Columbia — including Pennsylvania and led by Washington state — sued Wilson, Defense Distributed, and the federal government in Seattle, leading to the temporary ban on July 31. But residents of Pennsylvania and the other states party to the lawsuit were apparently unable to order by mail from the website on Tuesday. Shipping was unavailable to addresses in those states, and the website displayed the message, "Oops, you're behind the blue wall. Your masters say you can't be trusted with this information." Opponents say the ability for anyone with a 3-D printer to create a working and untraceable gun is dangerous; supporters say such files were already available online and view 3-D-printed guns as part of the fight against gun control. The blueprints Wilson is selling were available for download for a few days in late July, before the block, and have since been shared by other websites. Pennsylvania Attorney General Josh Shapiro said Tuesday he would look into legal action regarding the sales. In July, before Lasnik ordered the nationwide ban, Shapiro sued Defense Distributed in Philadelphia and Wilson agreed in court not to make his postings accessible in Pennsylvania. Selling the files to Pennsylvania addresses would violate "both our state law and the agreement Defense Distributed reached with the commonwealth," Shapiro said. In granting the injunction, Lasnik said the proliferation of 3-D-printed guns could increase the threat of gun violence and that posting the data would subvert laws in states that have more restrictive controls on firearms. And, Lasnik added, "the private defendants' dogged pursuit of the right to publish these files — and the evident alarm with which the proposed publication has been met in the Congress, in the White House, amongst advocacy groups, and in statehouses all over the country — suggest that further publication is not harmless." In unveiling his sales plan, Wilson referenced a section of the judge's order that specifically noted that the files could be shared in other ways. Lasnik wrote that the injunction would not breach Wilson's First Amendment rights to publish the files because "the files cannot be uploaded to the internet, but they can be emailed, mailed, securely transmitted, or otherwise published within the United States." Last week, Wilson told a Bitcoin.com podcast that he planned to sell the files. Bitcoin.com CEO Roger Ver has pledged to match in Bitcoin currency up to $100,000 in donations to Wilson's organization, according to the podcast. "I'm just going to start selling the files on my site instead of letting you download them. It's like, whoa, it's going to blow them [expletive] out," Wilson told the podcast. "I'm going to let them have their little victory — 'We saved America!' — and then I'm going to make millions of dollars selling the files next week." The case in federal court in Philadelphia is on hold pending the outcome of the Seattle case.